New seasons bring new beginnings and with winter, new chores. Shoveling snow is a task we have to contend with through the winter months. That is if we need to get anywhere with our cars. The best snow shovel will make the task comfortable and enjoyable also. Being picky about it is a good thing, after all, it’s going to be your trusty companion for the whole winter. But who said you have to get all sweaty and tired? With the right snow shovel, you can start enjoying moving snow, and the whole process becomes bearable. We have compiled the best snow shovels both manual and electric to suit your liking. These shovels have been designed to make working in extreme weather much easier and way faster. We have chosen them precisely because they beat the odds in durability, handling, and manageable weight. As the name suggests, they carry a telescopic handle to ease the shoveling process. Most of them extend to great heights for tall people. They can also retract through a simple adjusting process when in use by short people. The blades are usually of aluminum to make them lightweight and effortless to carry. This type of shovel works by scraping and pushing the snow in one direction. It has a mowing blade which is not intended for lifting. It is designed for just pushing snow, and with that back, the strain is averted. They are popular with people who can’t lift heavy loads. These shovels use heavy-duty scoop blades to cut through the snow. They can clean out large sections since they have sturdy frames. They can also cut through ice since the blades are wide. Many people gravitate towards this type of shovel for light snow falls. This type of shovel uses electric power to clear snow. They are ideal for driveways, paths, decks, and walkways. They exude high power to throw snow to a far distance. Hence they are faster than regular shoveling. 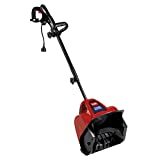 These shovels use an electric motor which runs quietly as compared to other powered snow blowers. Convenience: With a snow shovel, you can move light snow before it forms into ice. Unlike other blowers which are designed for packed snow. It can be kept in the car for emergencies giving you the chance to be out of danger. Flexibility: Most shovels can be of use like scrapers. They then become ideal for clearing tight spaces that are hard to access with a conventional blower. It does not limit the time you use it since it does not produce noise when working. Efficiency: A snow shovel can scrap the floor on all types of surfaces. If you need a clean area, it can get all the paths around the home accessible in just a short time. Depending on your likes and preferences, you may either choose an adjustable handle or a solid handle. If many people are using the shovel, you’ll benefit more from an adjustable handle. A handle is crucial when it comes to lower back strain. If you use a shovel with a hunched back it’s more likely you’ll have painful muscles at the end of snow moving. It’s also important that you consider the hand grip. Some shovels have larger grips than others. If you are going to be using gloves, it’s imperative that you feel comfortable with the grip it gives. Do you need a scoop shovel or a push shovel? Your snow clearing needs also determine this choice. Scoop shovels work in the same way like regular gardening shovels where you load snow into the blade and throw it in the direction you choose. A Push shovel works like a plow. You walk behind it and move the snow to the side. Some of them come with wheels to make walking and navigating a lot easier. Generally speaking the size and weight of a shovel has to correspond with your height and strength. A long handle suits tall persons while people of average height can safely use shorter handles. Check the weight of a shovel before purchasing it. This is because if the shovel weighs more than you can handle even with the correct height is deemed not to serve you well. The idea is to balance the grip and the weight and stay safe from injury when working. If you are going with the electric shovel, you’ll want to consider the power. It is directly related to the performance since if the motor yields little power, then the snow blowing process is also going to be slow. Working in snow can make your hands very chilly. Some of the snow is bound to reach your gloves where it melts because of the warmth. That’s why you need heavily insulated gloves. Look for a pair this is specific to snow blowing tasks with water-resistant material. The best snow boots are also heavily insulated, waterproof and light in weight. Quality varies between the models, but it is essential that you keep your feet from freezing. When using an electric snow shovel, there’s bound to be snow that sticks to the chute. Without the right tools, it becomes an annoying maintenance procedure. With non-stick spray all, it prevents the snow from building up, and it comes off much easier. The same case applies to snow shovel blades. A good non-stick spray works for both the electric and manual shovel. This is another important accessory for electric snow blowers. It is usually long to unclog the snow in the process of blowing. It is dangerous to try to remove snow with your fingers. In fact, you should never try it. When you have finally identified the snow shovel to suit your purposes, keeping it in good condition is inevitable. Here are a few tips to keep it working in good condition for the longest time possible. Leaving your shovel wet will just invite in rust. Make sure it is dry, and it is in a condition that does not invite corrosion. Dabbing a film of oil works well to prevent the occurrence of rust. If any rust appears, it’s crucial that you sand the rust and paint the blade. After many uses especially on ice, the sharp end becomes dull over time. Invest in a good sharpener to ensure your blade performs in excellent condition each time. A blunt shovel will take up much of your time since it cannot slice snow efficiently. At the end of winter, you’ll put your shovel away and expect to use it after a few months. The way you store your shovel will determine how well it works. If your shovel has a metallic handle, you’ll want to apply oil to the full length. For wooden handles invest in a wood preservation agent. Always Store The Shovel In A Dry Place. Toro Power Shovel stretches technology to the limits with this innovative design. It uses power curve technology which sees a combination of a curved rotor and inverted funnel. These features work together to minimize clogging while efficiently moving snow. The telescoping handles make it a popular model since many people cannot get the correct height by just looking at a shovel. It clears far and wide thus it is the best power shovel you could ever pick. This is an ideal size for a shovel. The scoop is curved inwards, and it has a footstep for use when lifting heavy loads. It has a construction of aluminum meaning it is lightweight and strong for medium duty tasks. It is not your ordinary shovel since it comes with dual handles and two grip positions. You get to throw snow with confidence as it provides comfortable features. You probably love winter because of the games. Skiing and snowboarding are the in-thing so you must catch on your groove. The AAA 4004 is the shovel you want to take with you for outdoor adventures. It weighs only 1.3 pounds making it the lightest and most portable shovel on this list. It can fit in your SUV as it is, or disassemble it into pieces for even better carriage. This shovel has interesting handles they are not exactly telescoping by they are adjustable. You can either pull it up to 32 inches if you are tall or to 25 inches for the short persons. This way you’ll not hunch whenever you are throwing snow. This unique design makes it the best snow shovel at a very remarkable price. You can work at the level you want without back strains and hand fatigue. The AAA 4004 has an aluminum construction. It is meant to withstand the humid winter weather and stay as good as new. It bears a small weight since aluminum is not heavy metal. You’ll like that it is a 3-piece unit where it can come apart when you don’t have enough storage space. The small shovel is now ready to sit in your back seat or the trunk. And, when you need to use it in an emergency it comes together in three easy steps. It is virtually unbreakable so you can as well use it to knock off snow crystals from the stairs and side steps. If you ever wondered why power tools come in bright colors, you’ll not fail to notice the red on this shovel. It does not only take care of the aesthetics, but it also acts as a corrosion and abrasion barrier. It is hard to scratch off the painting on this shovel since it has been furnished to provide maximum protection. The red paint prevents exposing the metal to moisture. This is a functional unit that can take on light snow with ease. But it does not stop there. The tool is better than any plastic snow shovel you can find on the market. Because of the aluminum construction, it can slice through the deep and hard snow. Even better this unit is the perfect accessory when you need to move snow from your car frame or underneath the wheels. It is easy to see why we like it since you just pick it and be on the go. It’s not just any shovel that you can take and put in your car. But this one comes in handy when you want it for covering outdoor activities. From the construction to the easy handling, the combinations are just excellent. The only thing though, is you’ll not be able to use it to move snow in wide driveways. When it comes to managing a snowy driveway on a busy morning, you’ll want the fastest snow shovel available. The Toro Power Shovel could never have come at a better time. This is an electric shovel which uses 7.5Amp of power. You just plug it in, and the performance is as excellent as it gets. You don’t have to stress your back with tons of snow when you can complete simple shoveling with such a powerful tool. If you have a 50-by-20ft driveway, you can finish blowing the snow in approximately twenty minutes. It is capable of completing such a driveway if the snow has sunk only 4-inches. What’s more, this shovel has a capacity of blowing 300 pounds of snow per minute. This means you don’t have to wake up hours before going out. All you need is this shovel and a few minutes to get the job done. The Toro power shovel throws snow up to 20 ft. It is effective when the snow is light and fluffy such you can throw snow without doing repeat jobs. It can make a path up to 12-inches wide, and it cleans down to the pavement. Whether you want to clean decks, make a path for your pet, or your walkway, you can have a clean area in a short time. In one pass it can reach snow running 6-inches deep. When it snows the whole night, mornings will not come with whining since with such a tool you’ll be ready for work as you normally do. Do you hate shoveling because of the lifting and manual snow throwing? Well, you are in luck because this shovel comes with telescoping handles. You just have to find the correct height for you, and you’ll never bend again. It even has a cord lock, so it will never come off the plug in the process of blowing. Another important aspect is that it is lightweight. Since you have to do the pushing, you’ll find it glides effortlessly; thanks to the smooth underside. This power shovel can withstand heavy usage. It has a construction of robust plastic. It maintains its stability whenever you are using it on slightly hard snow. You can, therefore, expect it to last a decent period in excellent condition. Maintaining this shovel is like a walk in the park. After you have cleared out the path you need, just wipe off the stuck snow, and it’s ready for use, the next time you need it. Toro power shovel is all about convenience. It yields high power for completing jobs in record time. The performance beats the regular unpowered models since the effort is reduced and this increases the distance it can throw snow. However, if you receive heavy snow storms, this shovel will not work for you. Finding an ergonomic shovel is as easy as choosing the True Temper 26-inch Snow Shovel. It has the best combination of weight, materials, and size. With it, you can clean decks, walkways, and paths effortlessly. It is neither too large to make you make awkward movements when shoveling nor too small not to work efficiently. This shovel features an aluminum handle. It has been anodized since it can withstand the wet conditions without developing rust. This means it does not diminish in quality when you use it for long periods. As you know, aluminum is a strong metal almost next to resilient steel. This material is a good choice since it gives this shovel the small weight it showcases. Unlike other flat shovels, this one bears a curved shaft to ease the scooping process. It digs readily into snow hence minimizing the effort you’d usually use. This way you can take the swing quickly. It boasts dual handles such you can use both hands when clearing. This is all to reduce the labor and pressure you exert when lifting. It also comes with two lift positions so that you can lift just the way you like it. This shovel is not limited to just clearing the wide areas around your home. You can clean even the tight space that would otherwise need a slimmer tool. When you turn it to the opposite side, it becomes just the perfect tool to clean between walls and on steps. It also comes with a footstep to add stability when digging through packed and wet snow. The added leverage adds to your possibilities since there’s no need to invest in heavy equipment if the only challenge is hard snow. The True Temper is ideal for clearing broad areas. It can also sink deep as it has a 26-inch blade. It gets better when you can’t deal with heavy snow. The width allows it to be of use as a pusher where you can scoop more than when you would when using it just like a regular shovel. This shovel can also clean the surface. The good thing is that it can clean on all types of surfaces since you are not throwing snow at high speeds. This is not a power shovel, but it sure does the work close to one. The blade is robust, durable and it can clean small areas with ease. It is ideal for light to slightly heavy snow seeing that it can handle wet snow without getting stuck. The only disadvantage it that it takes longer to shovel with this tool than it would with the Toro Power Shovel. This shovel comes from a renowned brand. The expectations are quite high since it is from a manufacturer we have come to know and love. The properties showcase an impressive tool from the power to the performance. 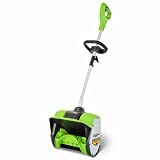 GreenWorks Corded snow shovel comes to make sure that every minute that you spend in the cold does not just go by. The snow throwing capabilities are just perfect for busy mornings and during emergencies. When you have a power shovel, you know exactly what you are getting. First, the throw distance is far, and the clearing path is also wide. Plus, the time you take to clean large areas comes down to more than half the time when using a regular shovel. This tool can throw snow out to 25ft. Whichever direction you choose to throw; you’ll be able to make a path long enough to pack a few cars. 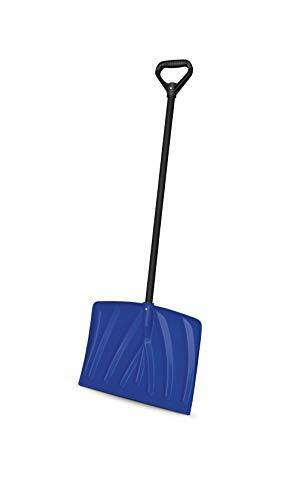 With 16inches clearing width and 6-inches deep, this is the perfect shovel for areas which do not receive heavy snow throughout the winter months. This shovel will make it worth your time. It comes with a 14-inch chute which throws out snow at 600 pounds per minute. It does not have a directional control, but you can direct it to the direction you want the snow to pile. When it comes to navigation, the GreenWorks is simple to push. It is equipped with 6-inch rubber wheels which glide on snow. They give you total control when maneuvering through on uneven surfaces. Using this shovel presents an effortless unit. It benefits from adjustable handles which go with your height. This way, your back will remain straight as you go about the clearing. You get to choose from three positions to customize the way you work with this shovel. The handles are fitted with rubber such that you get a firm grip when handling thick snow. The power cord is also long not to limit your movement. It has a cable lock which keeps it in position and keeps it from tangling when in use. This power shovel just needs dabbing with a dry cloth after use. The wheels and the blade may take up some snow, but that is the least of your worries. You’ll rarely ask for repairs or upkeep services since it has very few parts running. It only uses 10Amp power hence no carbon emission is experienced. This is a powerful tool. It has all the features you’d require from a shovel. GreenWorks make this unit with the user in mind. The handles, the throw capacity, and performance are ideal for an all-around shovel. Even with the high throw ability, you are still limited to the length of the cord unless you purchase an extension to expand your cleaning reach. The best way to make snow moving easier is by investing in this incredible tool. Suncast purposes of improving snow shoveling by offering this high-quality unit. It measures 18-inches such that it can sink deeper when need be. With it, you can accomplish more than just regular snow moving since it can work in tight areas. This snow shovel achieves great snow throwing thanks to the ribbed surface. It resists sticky snow since the textured surface ensures every time you throw the snow, the shovel remains clean for quick follow-ups. This means you can now spend less time in the cold and more time with friends and family around a fire. This shovel excels in resisting corrosion from the moisture lurking in the air. The handle has a construction from steel; hence it can withstand the pressure of slicing into hard snow. The graphite blade has a poly coating to ensure that it remains sturdy. With the navy blue color, it is sure to stay free of abrasion. This shovel is ideal for digging like underneath your car or clearing a considerable path. It comes in a compact size; thus it can fit in the trunk to take with you for emergencies. If your veers off the road into a pile of snow, this shovel will help dig the car out of trouble. It’s pleasing to see that with such a shovel, it can scrap to the floor; hence you can access lots of places that need a clean sweep of the porch. It is for sure one of the best snow shovels due to its lightweight frame. Most people can use it without any added pressure to the back. The handle is ribbed to ensure a tight grip when lifting. This way, you can maintain the correct posture when using it. If you are working on small jobs, then this is the shovel to choose. It is perfect for fluffy snow that has not hardened over time. It is an ideal accessory for your car during emergencies. The only thing is that you cannot adjust the handle so if you are taller than 6ft, you may be forced to hunch when using it. Will The Shovel Work On Gravel? The type of shovel you choose determines whether it can work on gravel or not. For scoop shovels, they can scrap to the floor, and since they are not powered, they are effective. You should, however, watch the pavement if it is soft, you’ll want to work with a different thrower. This is because a shovel is most likely going to scratch the floor, leaving ugly patches. Electric shovels are not ideal for gravel floors. They tend to scoop everything including stones and small rocks. This means as it throws out the snow, it is more likely to destroy the chute and even cause clogging. Does The Shovel Feature A Metal Strip? No, none of these shovels have a metal strip. The blades are engineered from robust material to enable slicing and to cut through the snow. The True Temper and AAA 4004 have metallic blades while the Suncast model has a graphite blade with a poly coating. The Toro and GreenWork electric shovels both use sturdy plastic augers. Only the AAA 4004 can be disassembled. The other brands have their handles installed with rivets. They are, therefore, not removable. We did everything in our power to help you find the best snow shovel on the market today by providing examples and reasons for why we chose them. Each shovel carries unique features to makes things easier for you when making the final decision. They are all durable, versatile and most of all reliable. We hope you can pick the best from our list.